Resco Cloud provides you with all-in-one business solutions that are highly customizable, secure, feature-rich, and above all, 100% offline-ready, no compromises. What do all Resco Cloud solutions have in common? Change the look, function and even business logic of your app to let it adapt to your specific scenario. Free yourself and your workers from depending on the internet connection. Work in 100% offline mode, even for days. From setting up login rules to device management, you get the tools to control every aspect of security by yourself. 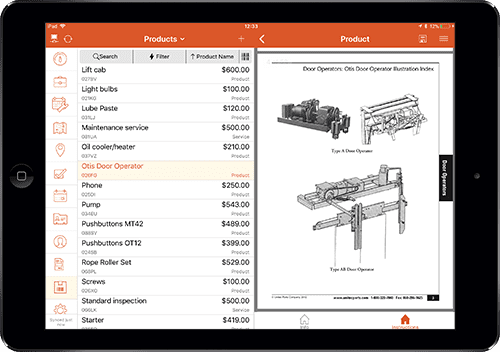 With our extensive library of features and configurable components you are sure to find just what your business needs. Work with your CRM data whenever and wherever. Enjoy accounts and contacts neatly organized on a map, lead qualifications and opportunity generation. With the ability to access all product information, show custom presentations and even sign contracts on the spot, nothing stands in your sales team’s way of wooing the prospects. Today’s field service is impossible without mobility. Access customer’s service data and request service appointments directly within the mobile app. Incorporate all metering devices and other gadgets in the terrain thanks to IoT. Inspect, snap a few photos for proof, sign, and send. And no field service process is complete without a dispatcher console, to effectively manage your resources. Tired of using external GPS? Imagine having your day planned, all within your mobile app. Make appointments, visits, and even calls – on the road. 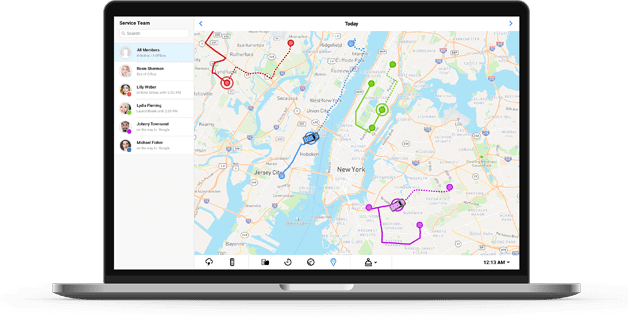 A productivity booster like none other, with automatic route change notifications, multiple route plans, visualization of completed routes, and on top of all that – offline maps, with directions always available at your fingertips. Dispatching and supervising your team on the road has never been easier. Set up dynamic forms, unique questionnaires, surveys, checklists, and even to-do lists. Assign them to your staff in the field and give the tool to complete inspections effectively. Analyze collected data afterwards. Resco Inspections consists of four apps – a Designer, Scheduler, Inspector and Analyst – which enable you to shape every step of your inspection process. An intelligent platform for local governments transforming your city in the 21st century. 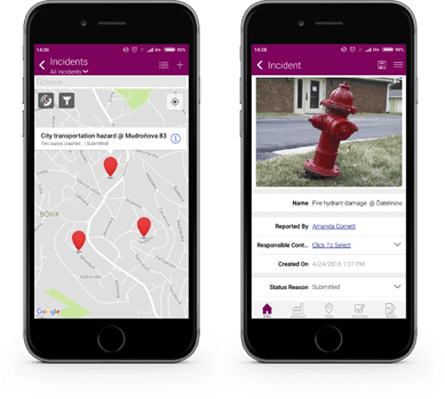 Join the digital revolution and provide residents with an app enabling them to report problems in the neighborhood such as potholes or damaged public property. Assign reported tasks to a service technician and notify citizens once it has been resolved. Transparency and teamwork in one. Do you want to build an entirelly custom solution from scratch? Our robust development platform is here for that. We provide you with the building blocks, you do the rest – with the minimal amount of code. You don’t have to forget about all those tools you are already familiar with. Integrate them instead for a seamless work experience within one solution. 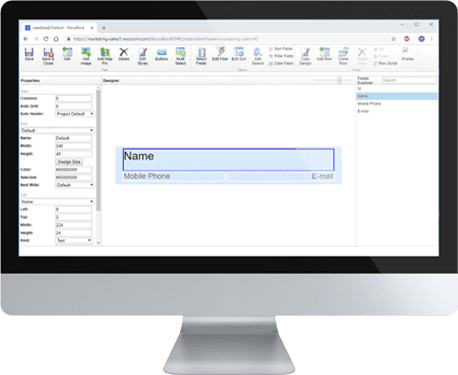 Access your data on the go and connect your Microsoft Dynamics CRM to Resco Cloud with ease. 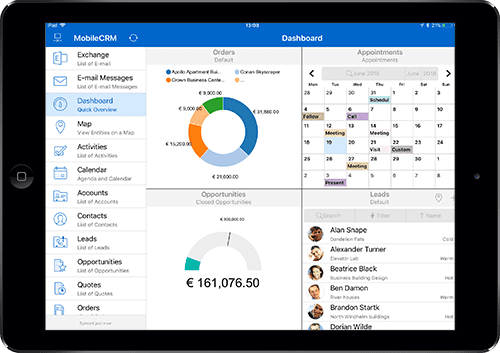 Read more about the Mobile Client for Microsoft Dynamics 365/CRM. 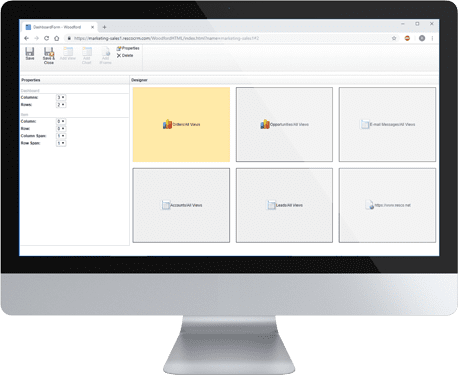 Connect and work with your Salesforce data instantly and securely. Go offline with no restrictions. Read more on how Resco Mobile CRM enables your Salesforce data with true offline mobility. Enhance your Oracle Sales Cloud and Oracle Service Cloud by going mobile with Resco Cloud. 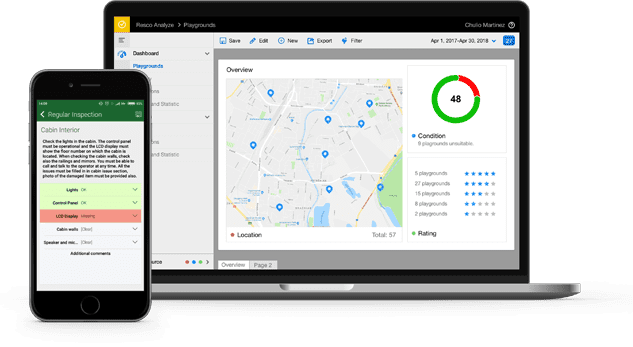 Connect with your ERP and work with your data instantly. Access, modify & upload new documents within one app – even with no Internet connectivity. Easily track your Gmail emails in CRM & work with documents to and from Google Drive. Access, update and share Dropbox documents with colleagues directly from the Resco Mobile app. Communicate and collaborate with your team without ever leaving your CRM solution. Get the best of both – CRM & Email worlds.